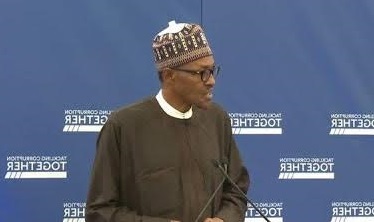 President Muhammadu Buhari has said that he would not be demanding any apology from British Prime Minister, Mr. David Cameron over his diplomatic gaffe, describing Nigeria, along with Afghanistan as ‘fantastically corrupt’. President Buhari said instead, he would demand action from Cameron, by returning Nigeria’s stolen money and assets stashed in the United Kingdom. Buhari made this clear as he addressed a Commonwealth conference in London this morning in the wake of Mr Cameron’s diplomatic gaffe. The Presidency and several other Nigerians, have however, lashed back at the British PM for that scathing remark. This came as the Presidency, yesterday, expressed ‘shock’ at the unguarded comment, saying that Cameron must have been looking at an old snapshot of Nigeria. However, the president Wednesday morning refused to criticise Cameron directly when he was asked about the blunder at the conference.